IROQUOIS, Ontario – Dining resource O-Palier expanded its custom chair, adding the Marilyn to its assortment at the recent Canadian Furniture Show. 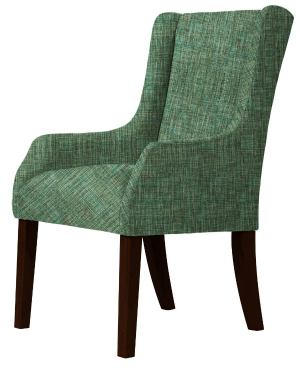 Described as both “curvaceous and comfortable” the chair can be used as either a dining chair or as an accent chair. “It’s transitional design can be dressed up to compliment both contemporary and traditional decors,” marketing manager Elizabeth Casselman says, adding Marilyn is one of the hottest sellers in O-Palier’s custom chair program. The chairs are crafted from solid wood frames and feature a no sag-spring seating construction. While the frames are manufactured in China, they are finished and upholstered at O-Palier’s facility here in Iroquois, which is located on the shores of the St. Lawrence River west of Montreal. The custom chair program, which now has 16 frames with the addition of the Marilyn, launched in the spring of 2015 and each piece is upholstered to order and can be shipped anywhere in North America. It has an opening price point of C$206, Casselman noted, adding the aim of the program is to bring value to higher level. The chair frames are developed through carefully thought out designs and meticulous material selection by O-Palier’s team of chair experts. The designs are then mass produced in large quantities but remain unfinished. O-Palier then stocks the frames and then upholsters and assembles the product here. The program also features more than 100 fabrics choices. “The program is ideal for the independent retailer looking for a high end product at a price point the average consumer can afford,” Casselman said, adding the company is looking at adding an assortment of accent tables to its offerings. In addition to the Canadian Furniture Show, O-Palier also shows at the High Point Market.